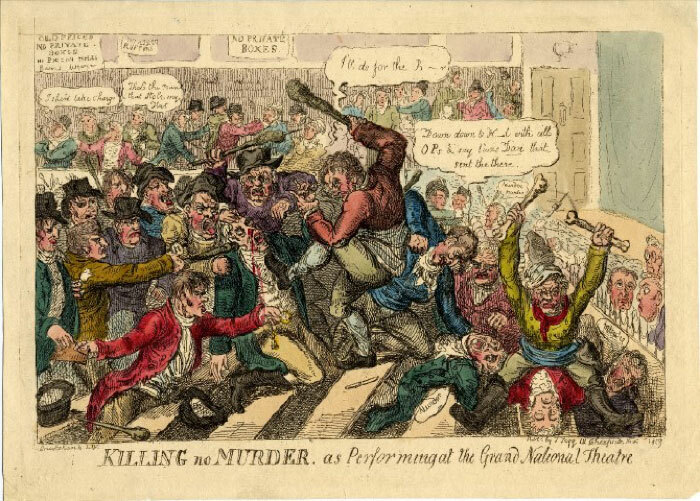 George and Isaac Cruikshank, Killing no Murder. as Performing at the Grand National Theatre (November 1809). Crazed ruffians savagely attack O.P. audience members, including the bleeding and unconscious man near the center of the image; his assailant kicks him in the chest. A fellow bruiser to his right cries, “Down down to H—l with all O.P.’s & say t’was Dan [Mendoza] that sent the there.” Courtesy of the British Museum.